Aloe haworthioides growing leaf plant succulent of the genus Aloe also known as Haworthia leaved Aloe, Aloe haworthioides perennial evergreen used as ornamental drought tolerant plant, can grow in mediterranean, desert, subtropics climate and growing in hardiness zone 10+. Leaves color green with little spiny in the edge like hair in cone triangle shape, the leaf thin in size of 5-10 cm, leaves grow in rosette shape. Flower color light orange in cone shape the flower grow on stems that grow in the middle of the plant. Aloe haworthioides VAR. 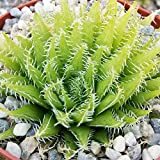 haworthioides Rare Succulent Plant Cactus Miniature 4"
Aloe haworthioides Exotic Madagascar Rare Succulent Cacti Bonsai Caudex Plant 2"
Aloe HAWORTHIOIDES Rare Succulent Plant Cactus 4"